Sitting in the away dressing room at Easter Road is a moment that will live long in Neil Alexander’s mind. The goalkeeper grew up supporting Hearts and took Sunday’s loss to Hibs as hard as anyone. He won’t let the dejection dissipate easily because he is eager to use it as motivation in the Premiership next season. 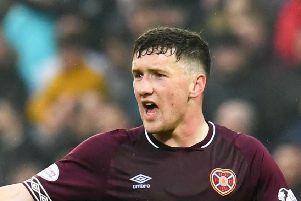 Hearts are heading for Scotland’s top flight as league champions, but showed none of their swagger in the Edinburgh derby. They left Leith with a 2-0 loss and had to digest a third league defeat in 33 matches so far this season. It was a rare sub-standard performance, but one which Alexander doesn’t want to simply disregard. When the time comes to visit Pittodrie, Parkhead or Tannadice next season, he intends to draw on Sunday’s disappointment. “Going into next season it’s there for the manager to say: ‘Remember how you felt sitting at Easter Road after losing.’ It does hurt and the players are hurting,” he told the Evening News. “We’re all bitterly disappointed but we’ll use this experience next season when we’re going away. Every game next year will be like that – fiery cup ties. We’ll use this as motivation for next year. “Maybe it’s a nice wee kick up the backside to let the players, individually and as a team, know there’s still a lot of work to be done. We’re not the finished article just yet. It will hurt me. Not only me because I know it’s hurting the other boys as well. I’m a Hearts fan and to get beat in the derby is gut-wrenching. Head coach Robbie Neilson complained that his players did not show enough hunger or desire against Hibs. Alexander is adamant the preparation work was as forensic as ever despite the manner of the defeat. “It’s not through lack of effort, believe me. The work is done on the training ground every day and we haven’t packed the tools away,” he insisted. “It just didn’t happen for us on Sunday. Maybe you’ve got to give Hibs credit for that, but maybe we could have done better as a team. That’s football. We wanted to win for the fans because again we had a great support. The notion that Hearts’ previously relentless momentum has dulled since promotion was confirmed is hard to dismiss. They won the title on Sunday, March 22, when Hibs lost at home to Rangers. Since then, the Tynecastle club have beaten Queen of the South and Alloa at home but lost in disappointing fashion at both Ibrox and Easter Road. “You could possibly say the momentum’s not there,” explained Alexander. “Hibs had a bigger edge to their game on Sunday. They are playing for something, whereas we’re not. The manager had drilled it into us all week how much he wanted to win the derby. We set our stall out to win so we don’t want to use that as an excuse. You could see the Hibs players were maybe up for it a bit more, but we have to respond to that and match it. We didn’t do it. If both teams definitely had something to play for, it would’ve been a different game. Neilson sprung a surprise with a 3-4-1-2 formation at kick-off but reverted to 4-2-3-1 eight minutes before half-time. Alexander is confident the change did not unsettle the Hearts players. “I don’t think you can blame it on the system. I’d say the players are good enough to play in any formation,” he said.